Bedroom 4: king-size bed, wardrobe, aircon, en-suite bathroom with hot shower. 2 more bedrooms in the guesthouse. 6 bedrooms, big pool on 1 rai of land (1.600 sqm). Living on the 'gold coast' of Phuket. 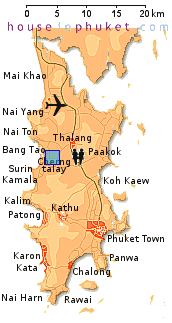 Bang Tao beach within 5 kilometers. kitchen: gas cooker with hood, fridge, hot water, oven. Private pool: 4 x 12 meter. Living room: sofas, aircon, LCD-TV. Guesthouse: 3 aircons, 2 kitchenettes, living and 1 king size bed.